Want to earn some big cash this weekend? Join the RummyCircle Tournaments and make a Weekend Loot of up to 4.75 Lakhs! Book your seats for free and finish the qualifier rounds to reach the finale to claim your cash prizes. The Weekend Loot Tournaments will run on 20th and 21st June 2015 with a maximum of 400 players reaching the finale. You will be getting not one but three chances to make it to finale of the RummyCircle Tournaments. From Qualifier 1 you can win cash prizes worth Rs.1,50,000. There are 224 tickets for Qualifier 1 and the entry to this table is free. In Qualifier 2 there will be 700 players with a prize pool of Rs.63000. The entry fee to this qualifier is Rs.100. 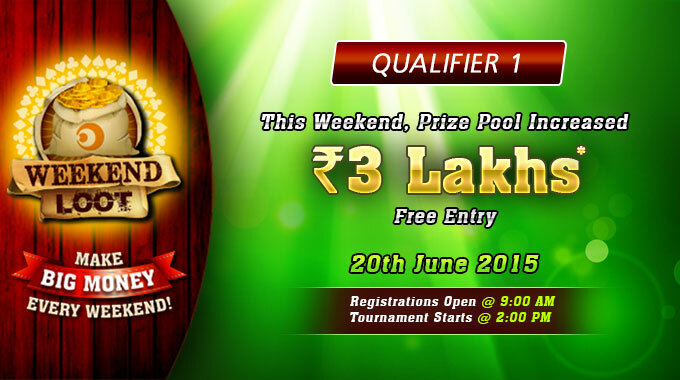 Also, you can join Qualifier 3 with an entry fee of Rs.500 and compete for a prize pool of Rs.1,12,500. There are 400 seats for the finale which are assigned in first come first serve basis. Finish the qualifiers as soon as possible and compete for a prize pool of Rs.1.5 lakhs! The RummyCircle Tournaments are your best chance for great weekend without any boring hours. Join the qualifiers and play your ace game to give a boost to your bank balance. We love to hear from you! If you have any feedback or suggestions, drop your comments below!